RAILROAD.NET • View topic - Wyman Bridge location? This is a photograph of the wreck. The photographer is looking south towards Arcade. You can see that the structure was very long and composed of wood. Given the length of the structure, the creek must have shifted or filled up quickly through that curve at times of high water. Compared to the pins on Chris's map, the route of the creek has changed significantly. You can also make out the concrete work of the abutment. Should anything be remaining in the creek today, it could be compared to this to see if it is a newer retaining wall of some kind. Part of the concrete from this abutment is still in the creek bed. thebigham wrote: 4 years after starting this thread, I finally found it! On this day in history, 116 years ago. There was a fatal accident on the BA&A gravel train on Tuesday forenoon which Miles Robinson, the fireman, was instantly killed, and the engineer, Frank Colby quite badly hurt. 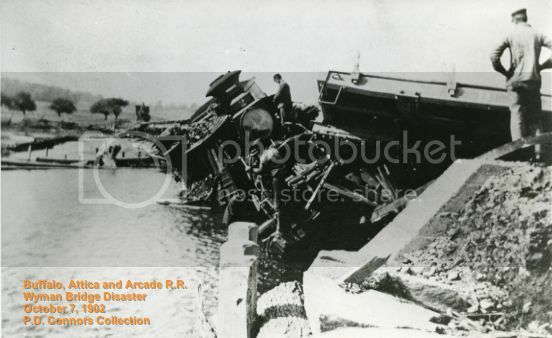 The engine and tender and several gravel cars are lying upon the broken bridge and the approaches thereto in a badly demolished condition. The accident occurred on the switch which runs from Arcade Village to the gravel pit above Sandusky. The train was coming from the pit with seventeen loaded cars about 9:30 a.m., and was running about 4 mph when the accident occurred. When just south of the bridge which crosses Clear Creek on the Wyman Farm, Engineer Colby noticed a peculiar rumbling noise and whistled for brakes. He says it seems as though the tender jumped the track and shoved the ties out of place. The engine went on the bridge, which seemed to sink right down beneath the weight of the engine. The bridge was an exceptionally strong one, being constructed of five spans of 20 inch girders, and the girders must have been pushed from the abutments or something of similar nature happened. After the crash, engineer Colby extricated himself with some difficulty and crawled through the cab window and did not realize that he was hurt for several minutes. His first thought was for the safety of his fireman. He looked and felt about as best he could, but could not see nor feel him. He then blew the whistle long and loud. In the mean time someone went to Dana Beebe’s house and telephoned to this village. Soon people who lived in the vicinity of the wreck and people from the village began to arrive on the scene. A determined effort was made to find Robinson. A plank was laid across the water to the cab of the engine and willing hands were quickly at work digging in the coal which had been forced back from the tender to the cab of the engine. The hiss steam almost completely enveloped the cab and the rescuers. Suddenly a gust of wind wafted away the steam and Robinson was seen to be standing at his post near the boiler, held in an upright position by the debris and coal. After digging out some more of the coal the body was taken out without difficulty and gently laid upon the grass, where handkerchiefs were carefully spread over his face. The remains were shortly after brought to firemen’s building at Arcade, to await the result of the Coroner’s inquest. Upon examination it was found that his neck and one wrist was broken and death must have been instantaneous. He was badly scolded. There were several brakemen on the train at the time of the accident but they all escaped serious injury. Henry Connors was on the sixth car back of the engine and was thrown from the car to the ground. He sustained a bad sprain of one of his knees. Newman Dawley, a brakeman, has been in the habit of riding part way down from the gravel pit in the engine and was just making his way his to the engine when the accident occurred. He was on the fourth car and escaped injury. Frank Colby as soon as he realized that he was hurt, was taken in charge by Dr. H.P. Sharp and driven rapidly to his home where he was immediately put to bed. Since that time he has been so sore that he has been unable to turn over unassisted. He is getting along nicely however, and we hope to see him about again in a short time. Mr. Robinson’s death is a very sad happening. He was a generous, kind, hard-working man, devoted to his wife and children. He was going to move from Yorkshire to Arcade on the day of the accident, but as the steam shovel at the gravel pit was to be moved that day, he thought he better work the day and help move it, saying that he would lay off the next day and move his furniture. His daughter has been attending Arcade High School for some time past. He was 42 years old and leaves a wife and two children, who have the sympathy of the entire community in their affliction. The funeral was held from the home of his sister-in-law, Mrs. Clough at Yorkshire Thursday and was largely attended. The Coroner’s Verdict – Coroner Cassius Smith of Olean was telephoned for and arrived here on the evening train Tuesday and held an inquest. A number of witnesses were examined as to the speed of the train, condition of the track and engine, etc. The evidence of the witnesses in regard to the speed of the train varied from 3 to 5 mph. After hearing all of the evidence, Coroner Smith rendered a verdict of death by accident and exonerated the railway company from all blame in the matter. All summer the railroad has been putting gravel on their main line and have been running over this switch. The roadbed of the main line is in better shape now than it has ever been and the officials of the road are using every effort to give the public the best service possible.